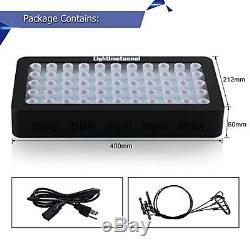 Aquarium LED Light Full spectrum Dimmable Lighting LPS SPS Coral Reef Tank, 165W. 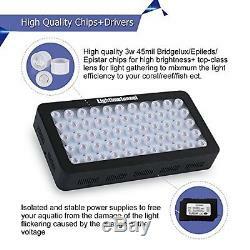 The Lightimetunnel LED aquarium lights are made using top quality 45mil 3w Bridgelux/Epileds chips to ensure high brightness & high light penetration to maximize absorption of the lighting. They add a delightful visual display to your aquarium and are beneficial to grow plants. These aquarium lights hood LED are ergonomically designed to maintain brightness and color over a long time and carefully crafted to last for years. 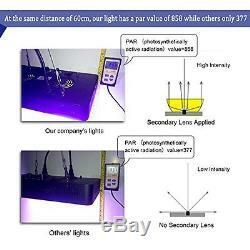 Our aquarium light covers the 120 degree LEDs with top quality acrylic lens. Our LED aquarium light has superior ambient light efficiency and remarkable color uniformity. It gives your plant a vibrant color for a luxurious feel. With a high resolution and low power consumption design, this LED Lighted bulb was born to give your aquarium a dynamic appearance and memorable experience. It coordinates very well with your aquatic pets! Our Aquarium light LED is safe to use over open water and perfect for planted fresh water or marine environments. It features an efficient light spectrum that makes the LPS/SPS coral/reef/fish/plant enjoy healthy growing. 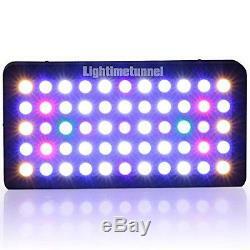 The eye-catching light wavelength include: red 660nm, blue 460nm, purple 430nm, royal blue 450nm, green 520nm, warm white and cool white. This LED light for aquarium lights up your aquarium for a modern look! 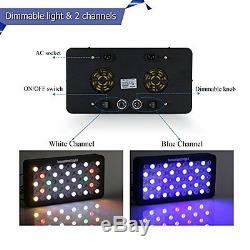 Dimmable LED light with 2 channels for setting lighting to stimulate daytime and moonlight. It has UL approved fans and heat-conducting plate that protects the lamps from heat and extend its lifespan. It is functionally designed with the dimmer that allows you to adjust the power adding or reducing the light as needed. With its controls, our LED light creates a special inspiring atmosphere for your fish tanks and will attract a lot of compliments to you. Suitable for freshwater/saltwater 242424 fish/coral tank, the Lightimetunnel led aquarium lights are factory direct sell and provide an easy after-sale maintenance. This led aquarium light covers the 120 degree leds with top quality acrylic lens ensuring high light efficiency. Proper spectrum makes the coral/reef/fish/plant enjoy healthy growing. Channel 1 (28 LEDs): Cool white, warm white, red 660nm, green 520nm Channel 2 (27 LEDs): Blue 460nm, purple 410nm, royal blue 450nm Two Dimmers, two power cords and two on/off switches to control the 2 channels separately White lighting promote the photosynthesis of aquatic plants and make water look very clear. Red lighting promote the growth of fish and make them look more colorful. Blue lighting makes the water clear and vivid as the sea water and is suitable for the growth of coral, Polyodon spathala etc. 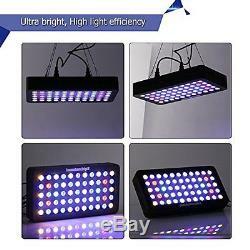 Package include 1 x 165W LED aquarium light 1x Hanging Kits 2 x Power Cords(US Standard 110V grounded 3 prong plug). Any product you return must be in the same condition you received it and in the original packaging. 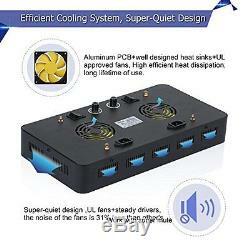 If you have any problem with your order, please contact me and I will do my best to make you satisfied. I usually respond within 24 hours on weekdays. Thank you for shopping at my store. The item "Aquarium LED Light Full spectrum Dimmable Lighting LPS SPS Coral Reef Tank, 165W" is in sale since Sunday, April 16, 2017. This item is in the category "Pet Supplies\Fish & Aquariums\Lighting & Bulbs". The seller is "yonik" and is located in Multiple Locations.